The prestigious offices in Aurora Melbourne Central are now 100% sold. It’s a business location your clients will admire and your staff will love. 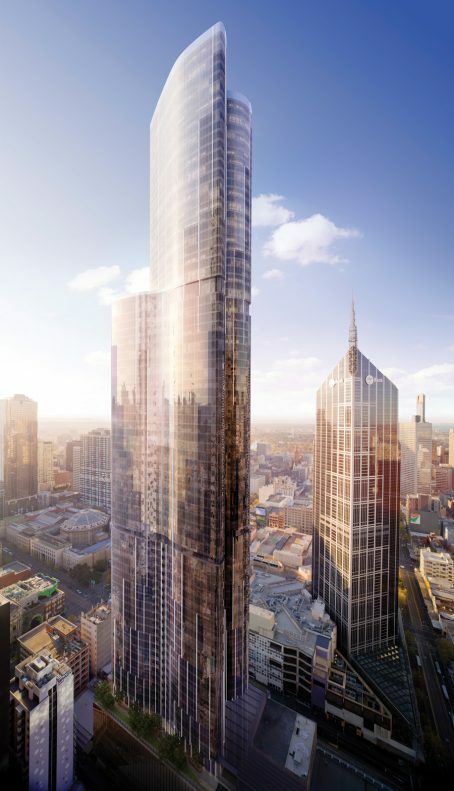 Designed by renowned architect Elenberg Fraser, this soaring tower will provide a new focal point for Melbourne’s central business district. Aurora Melbourne Central is an exceptional and innovative building that will send all the right messages about your business. 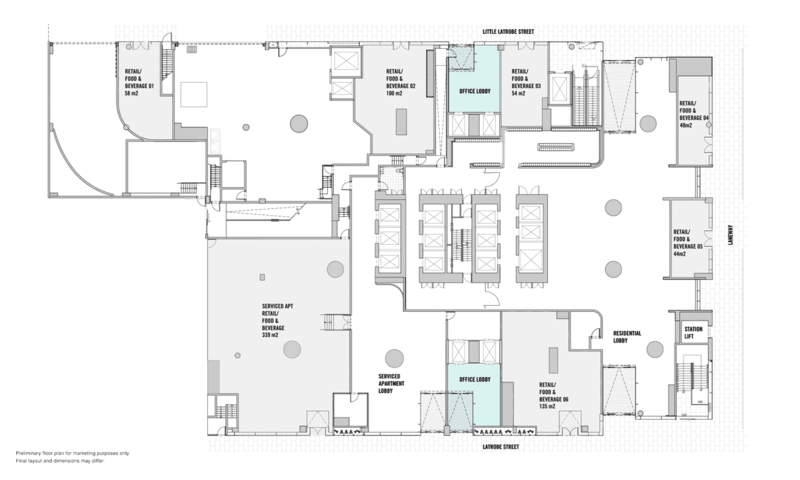 The offices feature regular shaped floor plates, generous natural light with expansive frontage towards and visibility from LaTrobe and Little LaTrobe Street. 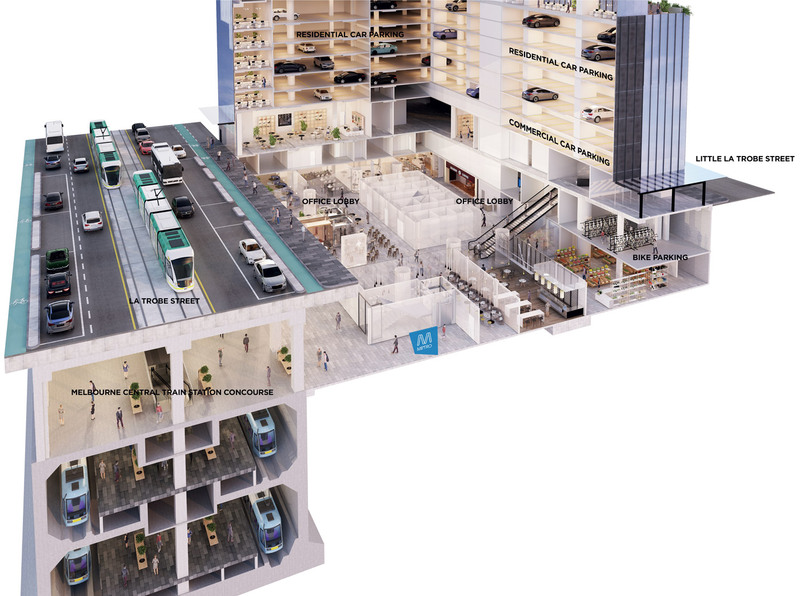 With direct basement access to Melbourne’s underground rail loop, Aurora Melbourne Central will make the daily commute easy for your staff. Bicycle parking and shower facilities will be available to the cycling enthusiasts as a healthy alternative mode of travel. A multitude of dining options will be on the doorstep and in the building’s own retail precinct. Every city service and the best of city shops provide the ultimate convenience. Aurora Melbourne Central, in the heart of the CBD, is the perfect place to keep your finger on the exciting pulse of Australian and international businesses. The offices are located at the podium from Levels 1 to 7. With a total floor area of approximately 3,460m2, choose from single floor plates of up to a generous 415m2 in area or opt for smaller strata office spaces to create your dream workspace. Access the offices from dedicated office lobbies directly from LaTrobe and Little LaTrobe Street. 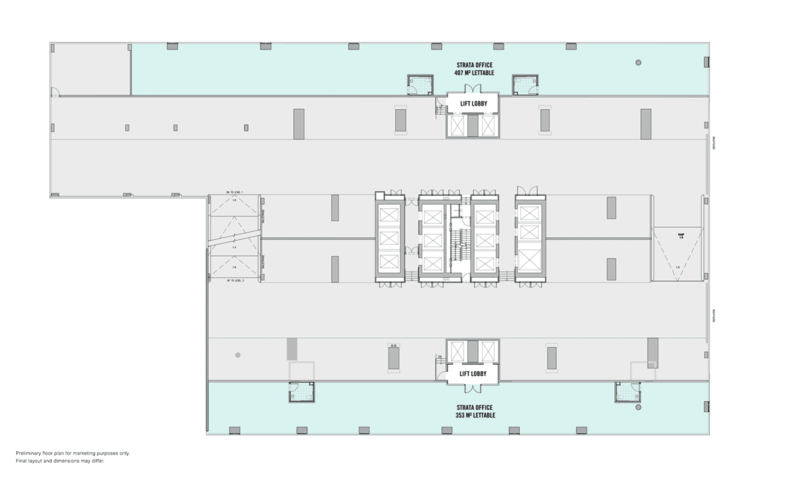 Lifts ascend into the offices with generous natural light and descends into the lower ground with direct connection to the Melbourne Central Train Station concourse and shopping centre. Aurora Melbourne Central will be a self-contained community, catering to your every need. From the lower ground cafes, restaurants and street-level signature retail, residential apartments and destination serviced apartments, you ascend to the office at podium Level 1 to Level 7. Car parking is located within the podium, while separate bicycle access, accommodating 700 secure bicycle spots and a changing and shower facility, is from Little La Trobe Street. Unprecedented convenience and connectivity to everything that truly matters including world-leading attractions. Solid tenant demand contributed to the Melbourne CBD recording positive annual net absorption over the year to January 2016, in turn helping to drive vacancy down to below 7%, which is expected to decline further over the coming 12 months. Sound State economic fundamentals, employment growth and a record low interest rate environment will support tenant demand upon completion. The CBD vacancy rate declined from 8.1% to 7% in the second half of 2016, driven by solid tenant demand, attractive pricing conditions in the leasing market and stock withdrawals. Key Office Influences: Economic Growth, Employment, Job Advertisement and Business Confidence. The Melbourne Central Business District is an employment, education and tourism hub. More than 220,000 people work within the “golden mile”. Aurora Melbourne Central answers the growing demand for a lifestyle that seamlessly melds home, work and play. Here, everything you require is within walking distance, much of it without ever needing to hit the street.